GPTPlanet has been online since October 2010 and the owner of the GPTPlanet is Dimitrios Kornelatos from Greece. He is also the owner of Scarlet-Clicks. Scarlet-Clicks has been online since 2009. GPTPlanet is a Paid to click site in which you can earn money by viewing advertisemet and referring other members to the site. In order to earn in GPTPlanet, You need to view advetisements for some seconds. You can earn from $0.0005 to $0.01 for each ad click. You will get more than 10 ads per day. You can earn extra money by compleing offers and doing daily survey. By clicking on the PTCWall at the top of the menu, You will find PTC Ads, quick task and network offers. You will earn 0.0001 for each PTC ads. You can get the survey from $0.35 to $0.70. GPTgrid is a game, which is very easy to play. You need to click anywhere on the picture and you can win up to $1. You will get 10 chances everyday. Each click will open an advertiser site and you have to view it for up to 5 seconds. 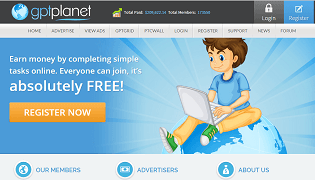 The best way to earn more money on GPTPlanet by taking advantage of referral program. There is no limit to the number of people you can refer to the site. The more referrals you have, the higher commision you will get. You will get 10% commision from your referrals each ad click. You will also get commisions when they purchase ads or upgrade their account. Note: You need to view atleast 4 ads today to earn from your referrals tomorrow. The minimum amount to cahsout is $1 for first request. After first cashout, the minimum cahout will be $2 only. You must wait up to 7 days to recieve your payment. All payments are made by Paypal and Payza. GPTPlanet has been online for more than 4 years and paying on time to its members. There is unlimited direct referrals program exist, So you can refer a lot of people to the site to increase your earning. They provide PTSU offers, in which you can earn by signing up on other website. You will get credited when your work is approved by advertiser. Most of the time, you will not get credited on such type of offers. If you have not enough number of referrals then your earning will be low. So try to get direct referrals to increase your earning. If you are not active for more than 60 days, Your account will get suspended. If you want to continue with the site, You must login atleast for every 60 days. GPTPlanet is a legit site and paying on time to its members. You can earn good income in this site if you have a lot of active referrals. Want to earn full-time income online? Check out #1 Online Work Program Here! If you want to ask any question about GPTPlanet or any other online work, Please feel free to ask. We will reply in jiffy.